Convenience can come with tradeoffs. The next time you put your arm in the cuff at a kiosk that measures blood pressure, you could get an inaccurate reading unless the cuff is your size. Correct cuff size is a critical factor in measuring blood pressure. Using a too-small cuff will result in an artificially high blood pressure reading; a too-large cuff may not work at all or result in an inaccurately low blood pressure reading. 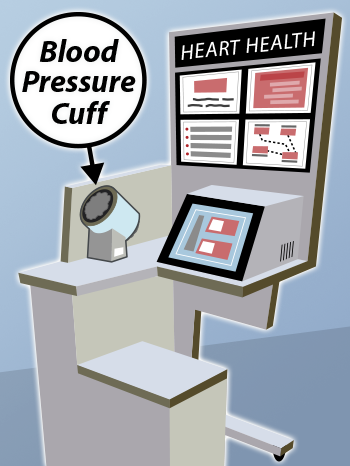 The Food and Drug Administration (FDA) is advising consumers that blood pressure cuffs on public kiosks don’t fit everyone and might not be accurate for every user. These desk-like kiosks for checking blood pressure are available in many public places—pharmacies, grocery and retail stores, gyms, airports, hair salons and even cafeterias. “They are easily accessible and easy to use. But it’s misleading to think that the devices are appropriate for everybody. They are not one-size-fits-all,” says Luke Herbertson, PhD, a biomedical engineer at FDA. Read why cuff size matters here.